What nature gives, nature can also take away. Last week the lights went out. Along with the power for everything in our house. It was heralded by an unbelievably loud crack of thunder and stab of lightning. The house plunged into darkness. And silence. This time of year we have air conditioners and fans running. Corgis don't do well in the heat. We want them to be comfortable. The background noise is something you get used to. Now it was gone, along with the quiet hum of the refrigerator and various background sounds of electrical appliances. The house was completely still. It was a bit of a shock. I grabbed my phone and used it as a flashlight to check the fuse box. Not us. We waited patiently for everything to come back on. Electrical crews usually worked fast. Nothing happened. The outage must be big. I got a glimpse of what the term 'deathly silence' meant. I could hear a ringing in my ears as if the sounds were still there. We grabbed our flashlights and made our way to the front door and out onto the porch. The whole neighborhood was black. No street lights, no porchlights, like a ripple the darkness spread out. We turned off the flashlights and stood watching the show of lightning as it sliced toward the ground and horizontally, cloud to cloud. The thunder finally reduced to occasional grumbles as the storm moved away. It was peaceful. And dark, did I mention dark? As I got used to it, I began to enjoy it. The dogs sat with us, not digging the storm or thunder. Sitting in the dark, petting a dog, I was content. There wasn't even any of that lingering nervousness that a diet of pre-teen horror movies could bring on. This was a good quiet, one born of nature, the feeling you get when you camp in a meadow and look up at the stars. What a contrast to the day they cut a fiber optic line and our cable, internet, and cell phones went down. It was like cutting junkies off from a fix. I found myself turning to my phone to find updates, only to realize my phone was a brick to the outside world. The world shrunk down to the space I occupied. And it lasted for hours. Our work is tied to the ability to access the Internet. I played games on my phone that didn't require a connection. I cleaned my office. I filed papers. Finally, after a few hours, I went home. Somehow being home with no connections is better than being at work. I wondered what it would be like to lose electrical service and all the other connections all at the same time. Unplugged from the world. I'd like to think I'd take the time to sit, and get in touch with my inner Constance. What would you do if cut off from power and the rest of the world? 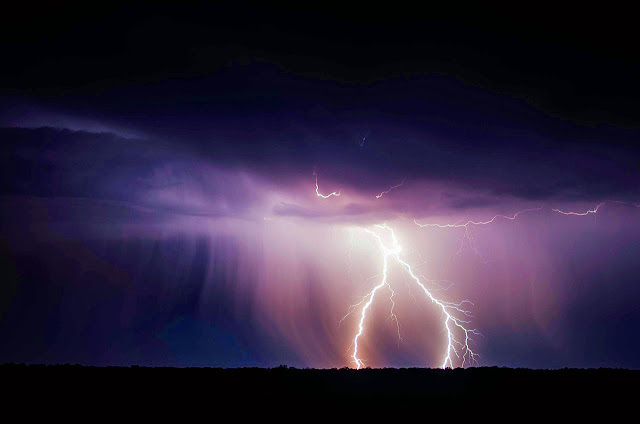 *Lightning photo courtesy of Pixabay. I, too, like the occasional power outage for its silence, its way of forcing us to be in the moment. But I am keenly aware that no power means no work for most of us, and it also means no refrigeration which not only affects food but also medicines. Modern life depends on having power. I'm not so sure that's a good thing, the way we've forgotten how to live without power, but I am grateful that those interruptions remind us just how lucky we are. Kath I don't think I could go backwards in my living. I like refrigerators and the internet too much. I got all the 'roughing it' I could stand in the Army. Power outages here are not uncommon. We read books, under the glow of led usb rechargeable emergency lights. Or a single incandescent bulb,hooked to a small power inverter,which connects to a 12V DC jump start power pack. If the outage lasts longer than 6 to 8 hours,I will hook a generator up to the garage and back feed the house,only running it periodically to keep the freezer freezing,and take a shower. Sounds like you are prepared! Just bought some more flashlights and LED lanterns yesterday. We can get by with emergency lanterns but the drawback of an all electric house is heat in the winter. Of course, we just cuddle up with a Corgi. They have enough fur for everyone!